Designed and tested for contractors and tradesmen who carry tools and equipment that exceed original manufacturers or legal load limits, or fit a bull bar, winch and long range fuel tank and still have load carrying capacity. The Ironman 4x4 GVM Upgrade will assist in satisfying OH&S, insurance and road transport regulation requirements. Ironman 4x4 has conducted all required testing to ensure complete integration with all safety systems and requirements as well as compliance to transport regulation. 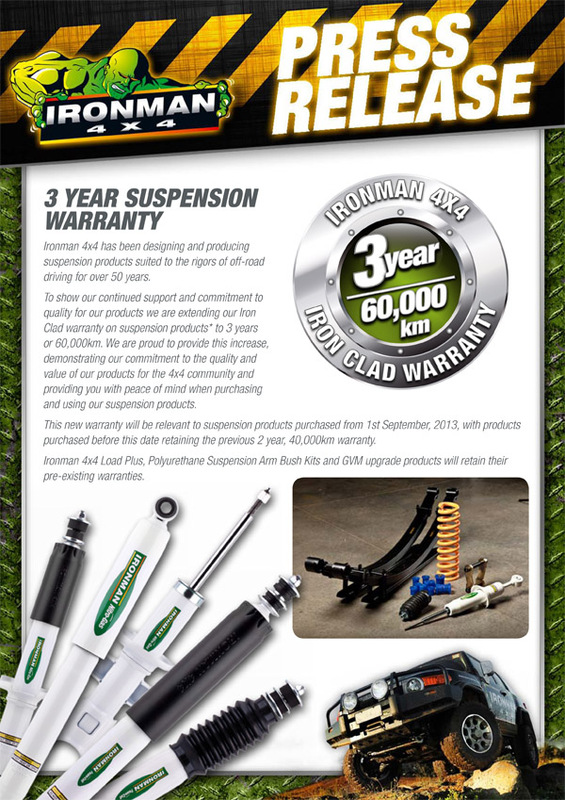 Ironman 4x4 is a world leader in the design and supply of 4x4 accessories, and 2018 represents 60 years of continued Australian owned and family operated business for the Jacob family. Introducing the Ironman 4x4 Thermo-plas canopy to suit the Nissan Navara NP300 2015+ Made of durable 9mm ABS plastic, with a re-enforced internal steel frame, the Ironman 4x4 thermo-plas canopy is rated to dynamic loads of up to 80kg on the roof. Internally lined with marine carpet and with an internal LED light, the canopy has a smooth premium finish. Introducing the Ironman 4x4 No Loop Bull Bars. The Ironman 4x4 No Loop bull bar, complements the contour lines of your vehicle, providing stylish frontal protection, whilst improving the vehicles approach angles. The No Loop Bull Bar is simple to accessorise to your liking, with integrated mounting points for driving lights, its winch compatibility, and the option to add a single chrome loop. Introducing the Ironman 4x4 Pinnacle Canopy, whether you’re on the job or away for the weekend, the Pinnacle Canopy will protect your gear. Built tough using vinyl ester fibreglass to provide strength and durability to withstand the test of time. Model specific moulding ensures the Pinnacle is stylish and sleek, complementing the design of your vehicle. Large lift up tinted windows provide easy access for those bulky items. The rear window features a central locking system, and the two side windows have dual locks for added extra security. Ironman 4x4 has now developed a Rear Protection Tow Bar to suit the Holden Colorado 2012+ Constructed from 4mm steel and offering a variety of features, such as side wing protection, rear tow points, high lift jack points and a hitch rating of 3500kg* the Ironman 4x4 Rear Protection Tow Bar has been designed to provide maximum strength and protection to your vehicles tub. Additional features include provisions for rear parking sensors, and provisions for an Anderson plug mount as well as recessed number plate lights. The all NEW Ironman 4x4 premium underbody protection solution to safeguard against offroad damage from rocks, stumps and ground strike. FABRICATED 4mm STEEL Construction is up to 5x more impact and penetration resistant* *(Than original 1.5mm pressed construction). INTEGRATED FRAMEWORK Design gives strength in most common strike zones, reducing plate deformation and deflecting force into load bearing elements. Ironman 4x4 now have Ford Ranger / Mazda BT50 Diesel Long Range Fuel Tanks. Take your journey further with the new Ironman 4x4 140L long range fuel tank. The Ironman 4x4 tank replaces the 80L factory tank providing you with 75% more diesel capacity, that gives you over 1500 kms between fills (based on Fords published 9.2L/100) The tank is made from 2mm aluminised steel with full internal baffles. The tank undergoes minimum 5 day pressure test to ensure the tank is fully sealed. 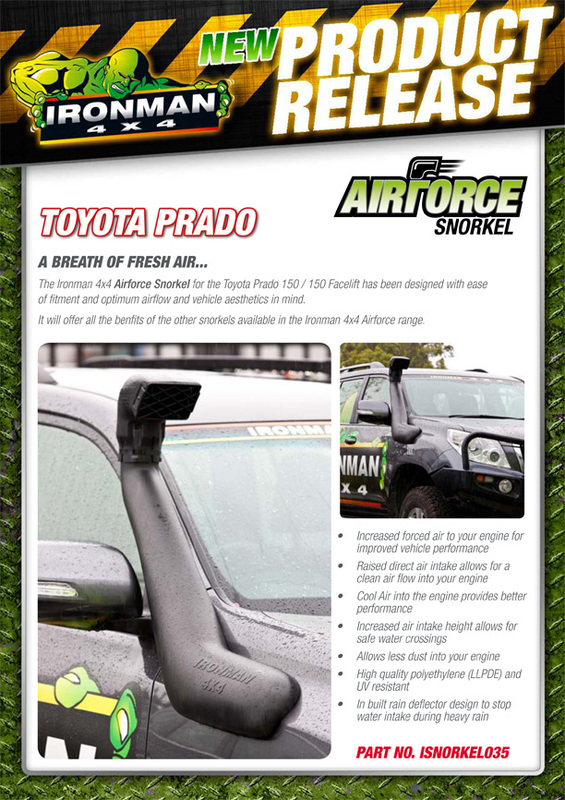 The Ironman 4x4 Airforce Snorkel for the Toyota Prado 150 / 150 Facelift has been designed with ease of fitment and optimum airflow and vehicle aesthetics in mind.